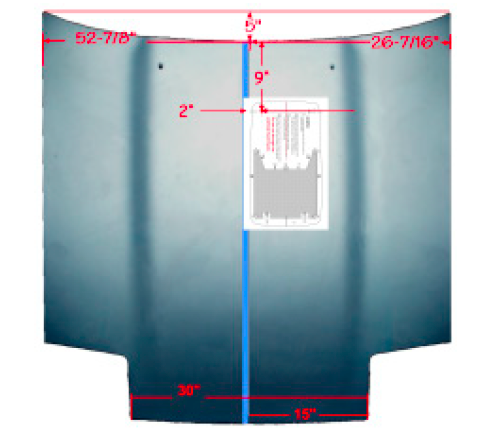 If you have a Non turbo or a 86-89 300zx that did not come with a stock hood scoop and would like to add the 84-85 turbo scoop or if you have an 1987-1989 and you want to add the sleek 200ZR scoop to your car, the following write-ups will help you do the install correctly. First start off by removing your hood. To do this have a helper hold the hood while removing the Hood shock mounts. There are 2 styles. One is a bolt on with a 10MM bolt on each mount. The other has a ball stud, To remove these unclip the hood strut and pull off the ball stud. 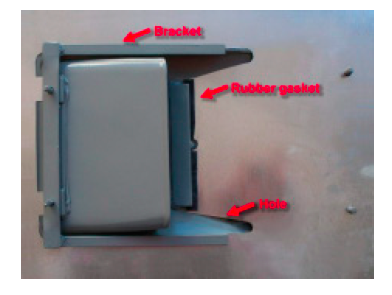 At this point you can then Remove the four (4) 12mm bolts at the hood to hood hinge. Next set your hood on a level surface. I used a set of body/fender stands to hold it as the Foam padding will not scratch the paint. Now lay out your holes and cutting marks as shown below. 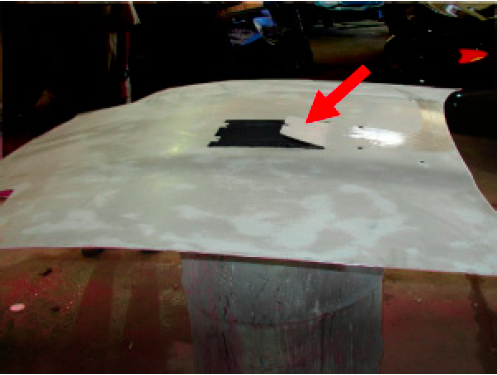 Once cut seal the bare metal with a brush on primer to protect the hood from rust. Now mount the scoop to the hood. Install your hood back on your car. Installation is reverse of removal. 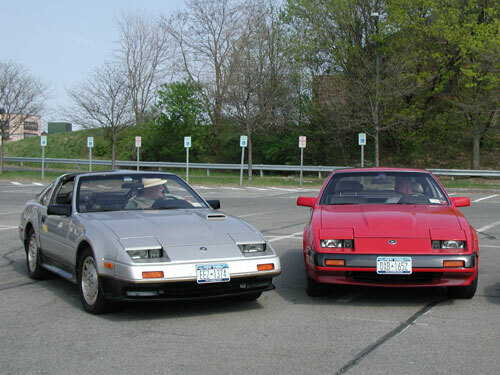 In 1987 the Z31 had many small body changes. It became more rounded and less sharp. 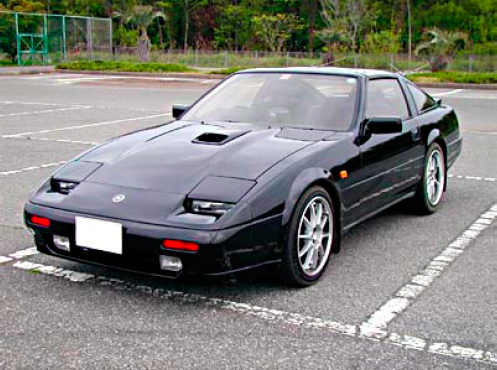 One of the nicer things that happened was on the Japanese 200ZR models the hood scoop used to bring in air for the top mount intercooler on these models was redesigned. Instead of the large scoop used on the first model 200zr the scoop was made smaller and blended into the hood more. It is best if you remove the hood from the car. Place the hood on two saw horses or a suitable stable surface. Measure across the top of the hood starting the tape 5.5 inches below the corner. 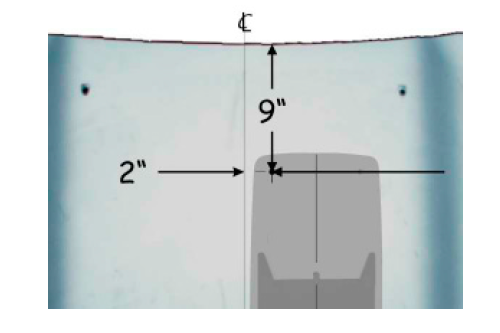 When the tape is extended to the opposite side, the mid point should fall right on the trailing edge of the hood which would be closest to the windshield. 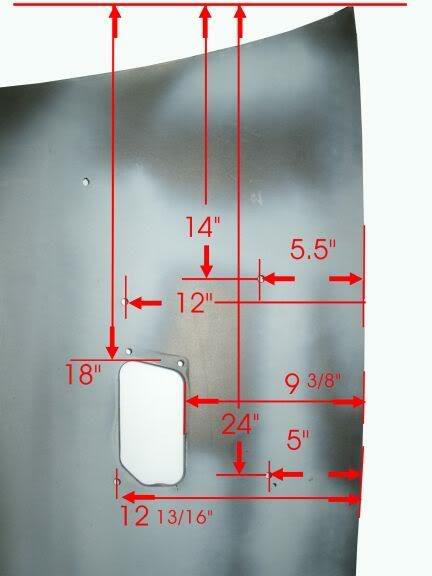 The hood should measure 52 7/8" wide. Mark at 26 7/16" by using a piece of masking tape. At the front of the hood, between the head lights, the width should be 30 inches, mark with tape at 15" Attach a length of masking tape to the left of your top center mark and stretch to the front of the hood, sighting down the tape as you lay it on the hood, as seen in the photo lower right. This line now defines the center of the hood. To insure that it is centered measure across the hood in several areas to check. The first hole you drill will be used to locate the template. 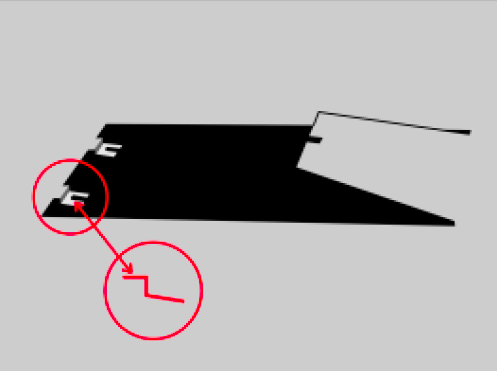 The above picture shows where to drill this hole. 9 inches down and 2 inches in from the center. Center punch this location. Drill a pilot hole using a sharp 1/8" bit. 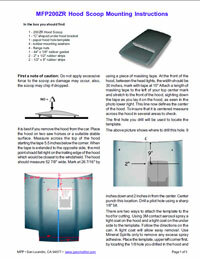 There are two ways to attach the template to the hod for cutting. Using 3M contact aerosol spray a light coat on the hood and a light coat on the under side to the template. Follow the directions on the can. A light coat will allow easy removal. Use Mineral Spirits only to remove any excess spray adhesive. 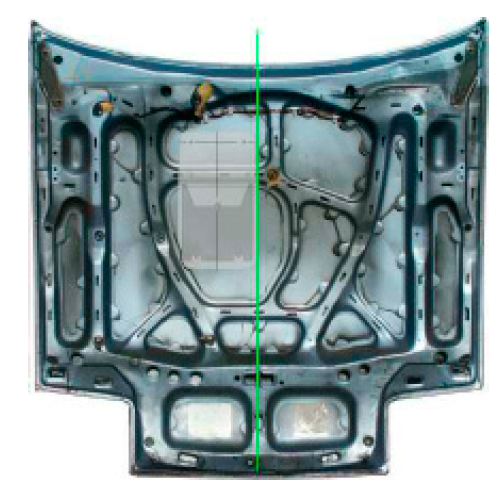 Place the template, upper left corner first, by locating the 1/8 hole you drilled in the hood and align with the upper left hand hole indicated on the template. Carefully lay the template down on the hood, aligning the left edge parallel to the center line tape, as seen in the photo on the proceeding page. The second way would be to use double face tape. Start by Dill the holes as indicated on the template. Do not drill into the under side bracing. The under side bracing for the 87 - 89 hood was designed to accommodate the OEM 200ZR hood scoop. If you start to drill into a brace, back out and re-drill. The two pictures above illustrate the placement of the pattern as if it was placed on the under side of the hood. 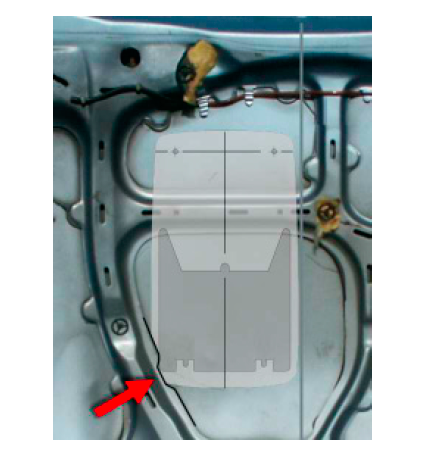 Note the notch that Nissan placed the brace (red arrow) to accommodate the hole for the scoop. Using a hand jigsaw with a metal cutting blade or a small die grinder fitted with a 2” abrasive cutoff wheel. Cut along the inside of the line, following the directions on the template. The area that is to be removed is the crosshatched area. Again, do not cut the bracing. You will end up with a hole similar to the one seen below. Please note the two tabs along the leading edge. Those two tabs will have to be bent down in a “Z” shape to fit over the raised portion where the front scoop studs are located. The “W” shape along the back is bent up slightly to fit under the retainer on the underside of the scoop. Test fit the scoop to check for proper alignment. 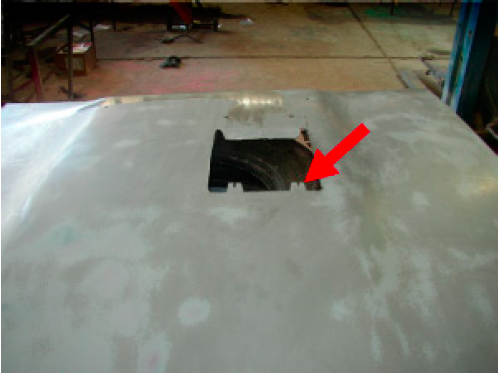 If you need to make any adjustment, do so by widening the bolt holes in the hood. After painting the scoop and before installing, apply the 1/8" by 4 foot (more than you need) long piece of rubber gasket material into the grove on the under side edge. Apply the round washer shaped ones over the mounting studs The 8" x 3/8" strips go on the top surfaces of the bracket where the bracket meets the hood. This brace is use to strengthen the hood where it is cut and prevent vibration. The last two 2.5" x 1" rubber strips wrap round the edges of the odd shaped “W” as indicated in picture below.